On the Breitenberg hill outside the town, the late Romanesque church of St Michael's was built in the middle of the 13th century. 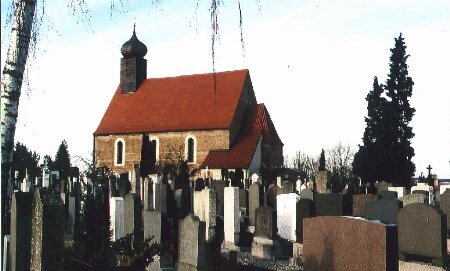 The simple building with a nave, an apse and a ridge turret was Moosburg's parish church until 1353. The churchyard is the town's cemetery since the dissolution of the burial ground at St John's in 1803. Last update 18 Feb 1999 by © Werner Schwarz (E-Mail) - All rights reserved!